Two Saint Mary’s biologists have received funding to investigate how environmental variation influences fish populations in Atlantic Canada, which should help predict how fish will fare with continued changes in climate. Drs. 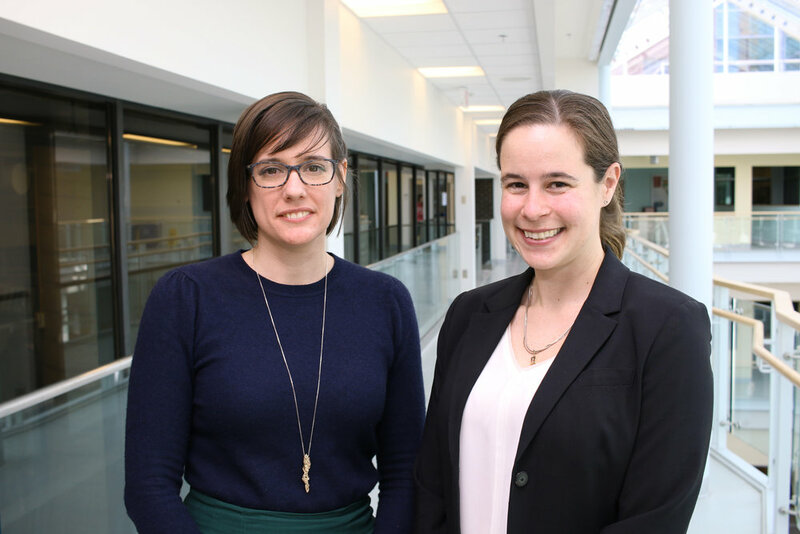 Laura Weir and Anne Dalziel will use their $200,000 John R. Evans Leaders Fund award from the Canadian Foundation for Innovation (CFI) to develop a Fish Behaviour and Physiology (FiBP) Lab at Saint Mary’s University. Integrative studies that combine the genetic, biochemical, physiological, and behavioural mechanisms are needed to understand how fish populations adapt to environmental change. The FiBP Lab will investigate how these mechanisms contribute to differences in environmental tolerance, physiological performance, and reproductive behaviour among populations and species of fish common to Atlantic Canada, including salmon, trout, stickleback, killifish, alewife, and herring. Research in the FiBP Lab will also help scientists and the public understand how biodiversity in aquatic environments is affected by coastal development. “Canada has the longest coastline in the world, and understanding how changes to coastal waters will impact the animals living there is essential,” says Dr. Anne Dalziel, assistant professor in the Department of Biology. The FiBP Lab formalizes an existing research collaboration between Dr. Anne Dalziel, an expert in fish physiology and evolutionary biology, and Dr. Laura Weir, whose expertise lies in behavioural and evolutionary ecology. Currently, the pair are working together to discover the physiological and behavioural mechanisms that lead to the unique breeding coloration of the white stickleback, an endemic Nova Scotian fish. The John R. Evans Leaders Fund (JELF) supports Canadian researchers by providing them with the research tools and infrastructure required to become leaders in their field. It also helps Canadian institutions attract and retain world-class researchers by remaining internationally competitive in areas of research and technology development aligned with their strategic priorities.